...Her life was transformed by the birth of her children Orla in 2002 and Joe in 2007. Her happy parenting experiences informed her involvement with the lesbian mothers' group, Out for Our Children. Her first book for young children, Spacegirl Pukes, appeared last year - she was proud that a book could be published in which a child had two mothers without the fact needing any explanation - and her second book, Dangerous Deborah Puts Her Foot Down, will appear soon. Her novel, High on Life, a fictionalised account of heroin addiction, was published in 2002. She is survived by her children, her parents and her sister Anna". I first met Katy in the early 1990s in Brixton where we were both living and both hanging out at the 121 Centre, an anarchist squat centre in Railton Road (home of Dead by Dawn club, which I've written about before). Katy was involved with Bad Attitude, a feminist paper, I was involved with Contraflow, a radical newsheet. Bad Attitude had an office at the top of the building and used to let us use their computer. I have so many memories of Katy, but as this a music site I will concentrate on that side of our friendship. Music was a central part of Katy's life - in fact in my last conversation with her, in the hospice just a few days before she died, she asked me if I'd heard any good new bands recently. Although she did not want to think too much about the possibility of dying, it is notable that she did go to the trouble of choosing the songs she wanted played at her funeral. So when a big crowd of us gathered at the Epping Forest Woodland Burial Park, we all came in to 'Denis' by Blondie and followed the coffin out to Magazine's 'Shot by Both Sides'. In the mid-1990s Katy was part of my clubbing/party posse. Saturday nights were often spent in the Duke of Edinburgh pub in Brixton, waiting for news from the United Systems party line about where the free party was happening - followed by a trip out to Hackney, or Camden or wherever. As I kept a sporadic diary at the time, I know that on April 29th 1995 me and Katy went to a United Systems squat party in Market Road, off Clarendon Road (north London). There were police outside with bolt cutters, so we had to go round the back and climb over a wall and across a rooftop to get inside. Another time we went to a party in a squatted church in Kentish town, with the sun coming through the stained glass after dancing all night. We also went to clubs - Megatripolis and Fruit Machine at Heaven, to Speed at the Mars Bar in '95 (LTJ Bukem's drum and bass club). Once in 1996 we got really glammed up and headed to Pique, a night promoted by Matthew Glamorr at Club Extreme in Ganton Street. It was cancelled , but someone gave us a flyer to a private party in Lily Place in Farringdon, a fantastic loft style party packed out with people dancing. Katy started getting into Americana, she introduced me to The Handsome Family and Alabama 3, whose Twisted night we went to at Brady's in Brixton. We went to lots of gigs at The Windmill on Brixton Hill, from alt.country to Art Brut, and we went to Electrowerks in Islington to see ESG (in June 2000). A lot of good nights, but no more, which is very sad. Still her five year old daughter has been jumping around since she could stand to The Ramones and, more recently CSS. Her son is just starting to stand and no doubt will be dancing himself soon. So the spirit lives on... I don't believe in the literal afterlife, but it's nice to imagine Katy wandering around in some punk rock Valhalla looking round for Joey Ramone and Johnny Thunders. The F-word, HarpyMarx and AfterEllen have all picked up on Katy's death, which would have pleased her. Shocking Pink in particular had a big impact and it's nice to know that some of yesterday's readers are today's feminist bloggers. I will dig out some old S.Pink and Bad Attitude and other Katy stuff over the next few weeks. 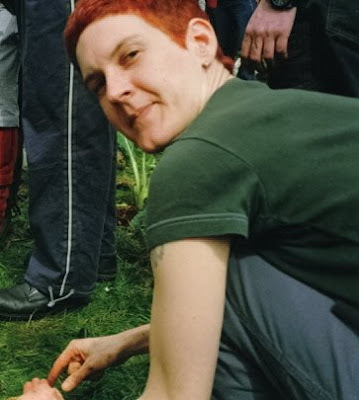 The photo of Katy was taken on the infamous May Day 2000 Guerrilla Gardening action in London's Parliament Square. Katy was a keen gardener, as well as Guerrilla Gardening on May Day she was a member of the Royal Horticultural Society, and got us tickets to the Chelsea Flower Show! I live 10 houses away from where the old 121 squat centre was in Brixton. I used to go to events and parties there too. I didn't know Katy, but the description here of her life and involvement in the squat parties of the late eighties and early nineties moved me to tears. Those times are gone now. My sincere condolences to Katy's family and friends. Thanks Paul, good to hear that the memory of 121 is still treasured by some Railton Rd residents. I sometimes wonder whether punks from far off corners of the world, armed only with a contact address from some old zine, still wander up Railton Rd searching for place. "I sometimes wonder whether punks from far off corners of the world, armed only with a contact address from some old zine, still wander up Railton Rd searching for the place"
They did for several years after it was evicted. Some neighbours and I sit on our front steps in summer and I remember being asked for the 121 often by tired punks and crusties with heavy rucksacks. It was a shame to have to give them the news that the famous 121 had been evicted and was now nothing more than a couple of poorly converted flats. Those flats must have got some interesting mail for awhile though. Thank you for those lovely memories. I'm not sure you'll see this as its so long after the event, but I have only just discovered Katy's obituray and your blog. Katy and I were best friends as teenagers in Reading but we regretably lost touch after my father died when we were 16 and I changed schools. I'm sorry I never managed to contact her and feel stupid for not trying harder to find her. For happier memories though, she was a music obsessive even as a teenager. We would complete on saturdays about who had bought the most obscure indy single from our local Our Price, the Higsons, Department S and of course her beloved Julian Cope and the Teardrop Explodes! We occassionally went out to see bands at the Uni but her mother was not keen on us going out to over 18 gigs when we were so young, and I think thought I was a bad influence. I think she relented on the night we saw New Order their first gigs after the demise of Joy Division. In those days she had a full head of thick curly brown hair that she hated but I envied. She also played classical guitar to quite a good standard too and was often trying to write her own songs in her beautiful handwriting. We both had matching Shaffer fountain pens, although hers had her name engraved on (I think I still have it, but I don't remember why). I'm not surprised reading about all her writing, she wrote so prolifically as a teenager, even if it was just her diary. It is one of real my regrets that we lost touch as I really admired her, she was so bright intelligent and creative. My heart and condolences go out to her family and her children, I'm sure she left a big gap in their lives. Yesterday (Wednesday 16th May) in order to still my mind I went for a walk in Brockwell Park and I eventually sat on the bench which was dedicated to Katy and this is how I discovered Katy had died. I just want to share with others my feelings: this amazing woman created a wonderful life for herself and her family and she definitely left her footprint of a value creating life ~ Katy's spirit is eternal. Love to Katy and Family.